London’s main index closed higher as investors snapped up shares in the Royal Bank of Scotland after the lender swung into profit. The FTSE 100 ended 0.25% ahead at 7,505 points, with RBS 1.7% better. 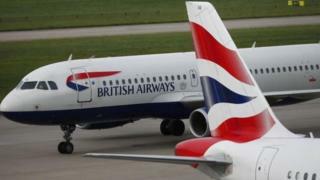 British Airways owner IAG was the biggest faller, down 7% despite the airline group reporting higher profits. IAG said that third-quarter operating profit before exceptional items rose 20.7% to €1.46bn (£1.3bn). However, the key measure of revenue growth per available seat slowed to 0.7% in the quarter from 1.5% in the previous three months. IAG results had a knock-on for Easyjet, which finished 3.2% down. On the FTSE 250, Tullow Oil dropped 2.4%, recovering from a near 6% fall earlier in the day, after the company said it had plugged and abandoned its Araku-1 exploration well in offshore Suriname. Across Europe, Spain’s Ibex share market was down 1.45% as the country faces a territorial showdown after Catalonia’s regional parliament voted to establish an independent republic. Elsewhere, Germany’s Dax rose 0.6% and the Cac 40 in France was 0.7% higher. On the currency markets, the pound was down 0.3% against the dollar at $1.311, as a strong performance from the greenback was supported by better-than-expected figures for the US economy in the third quarter. Sterling was also 0.3% higher versus the euro at €1.132 after the European Central Bank hinted that further monetary easing beyond September 2018 could be needed.